BYU students can apply for an exception to the honor code’s ecclesiastical endorsement requirement. Generally, students who desire to either (A) formally leave the LDS Church, or (B) cease LDS practice such as church attendance and participation in their ward, should use this process. As of November 2016, FreeBYU is aware of three cases where students applied for an exception after the November 2015 change. In all cases, after some interaction from the Dean of Students Office, that same office ceased responding to the applicant, and returned neither an accept nor a denial to the application. There is also evidence that exceptions are rarely if ever granted. 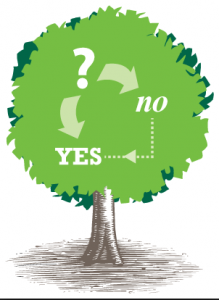 Until further actual cases are documented, we recommend following this decision tree. You have nothing to lose, either because you intend to transfer, have been irrevocably suspended, or some other reason. No: we recommend you stop. Do not apply for an exception, as the risks (non-response, denial, and increased honor code office interactions) materially jeopardize mental health and educational prospects. Your ecclesiastical endorsement was withdrawn, you resigned from the LDS Church, or your Bishop refused to sign your annual endorsement renewal. Yes: go to next right away- you have five business days to apply for the exception. No: wait- one of these must occur as a prerequisite to apply. You plan to resign, or have recently resigned, from the LDS Church. Reach out to pr@freebyu.org with questions.